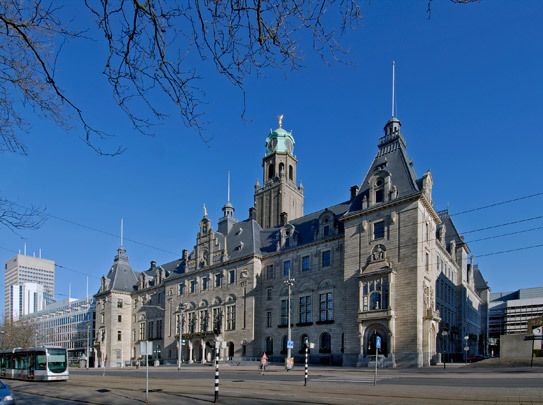 The City Hall and the post office were built when the waters of Coolsingel were exchanged for a road and 't Zand (the red light district) was demolished. In 1913 a limited entry competition among seven architects to design a city hall was won by the neo-Renaissance submission by Henri Evers, who had in fact organized the competition. The building comprises four wings four storeys high about a public court; the overall shape is a rectangle of 86 x 106 metres. Presiding over the City Hall is a 71 metre high tower in reinforced concrete above the main lobby. The building's exterior is dominated by the sandstone of the elevations and the tall pyramidal slate roofs.